Gemini flyover over was built by East Coast Construction and Industries in 21 months at a cost of 6.6 million and was opened to traffic on 1 July 1973. It is dubbed one of the top-rated flyovers in the country, and is the first flyover in Chennai and third in India. In the years to come this flyover has been denominated with additional fame owing to its proximity to the United States Consulates and the number of people daily plying the road. There is even a Statue which adds to the beauty of the flyover. Never in the mind of the builder of this celebrated flyover had this thought that those Tibetan students would one day choose this place for the street protests to vent their anger against the Chinese government. 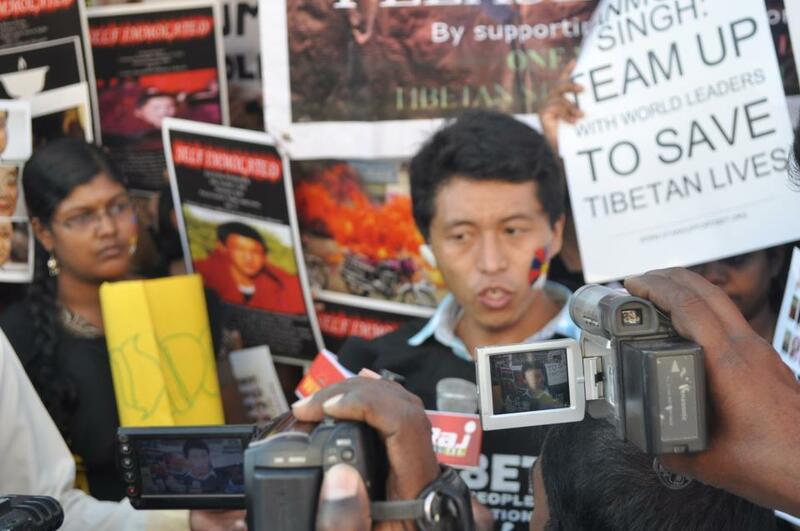 The Tibetan students in Chennai under the banner, ‘Tibetan Students Association of Madras’ (TSAM), have organised numerous protest campaigns in order to propagate and spread awareness about Tibetan plight in Tibet under the oppressive Chinese rule. All of these had been undertaken with the police permission and under the given place which the government or the state police allotted to us. Over the years, despite following the same vein of protest against Chinese rule, new generation of TSAM members found a new way of snatching media and public attention, which the elder and early active students of the city failed or never thought to do, ‘The Street Protest’, the protest that sent shock waves to the Chennai police and intelligent officials not for the first but for the third time. In 2008, few months ahead of Beijing Olympics, Tibetans all over the world especially in India were filled with the mania of protest. They thought that this would be the best chance for them to highlight the human rights condition in Tibet and to fight internationally for the freedom of Tibet. Not only did people, but the government in exile itself took the best initiative they had to ensure that the Beijing Olympic was countered with the flashing of any news about Tibet. All the four major Tibetan organisations in India, including, Tibetan Youth Congress (TYC), Tibetan Women’s Association (TWA), National Democratic Party of Tibet (NDPT) and Gu Chu Sum (Ex-Prisoner’s Association) took active part in the freedom struggle from Indian soil to address the Tibet issue. Everywhere, United States, England, Switzerland, France particularly where Beijing Olympic torch travelled were filled with anti-China movements. Jantar Manter and Chinese Embassy in New Delhi were wrapped with Tibetan protestors and flags. In the same year in Chennai, TSAM students which first maintained quiet for sometime suddenly burst out in the open to the surprise of Chennai city police. For the first time Gemini Flyover known for its proximity to United States’ Consulates is invaded with peaceful protesters clad in just an underwear and body fully coated with anti-China slogans. Banners were for the first time unfurled from the flyover. For the first time protest was undertaken without permission from the city police. The media well covered the protest at the Gemini site while protest undertaken at the police permitted area almost went blind to the media people. This first protest marked in the mind of Chennai Tibetan Students that doing something at such place where media covered every move and protest we took appeared in every paper cemented our resolve on such move in the years to come. It was on August 8, 2008, where two protests were undertaken one with permission and other without. Gemini Flyover, interestingly was first tested for the protest site not by the TSAM students, but by volunteers students from Bylakuppe Tibetan School with the help of TSAM. The author of this article don’t know who exactly gave that idea of Gemini-Flyover-Protest, however, it was said that one of the early Chennai college students working as a teacher in their school provided the idea. Gemini protest was successful so far as our goal of expressing anger against China and spread of message and awareness among the Indian people and media were concerned. The students were arrested at Thousand Light police station on the same day and were released around late 10 o’clock in the night. They were released with stern warning. We had hard time releasing them however, we did our job and police did theirs. Again, the second besieging of Gemini Flyover took place in March this year (2012). There were again continued self-immolations taking place inside Tibet and photos of charred Tibetan brothers and sisters filled the news papers and other media. This really was a message from Tibet that they are suffering under the oppressive rule of China in Tibet. Tibetans again all over India and elsewhere partook in protest against China’s indifference towards Tibetan issue and self-immolations. TSAM in Chennai under those circumstances, hold emergency meeting (it’s very famous and popularly known as brainstorming meeting) to discuss what immediately needs to be done in view of such disturbances. Meeting was continuously held often as to chalk out various plans in order to successfully execute the protest in Chennai. Students in city worked hard to prepare for the same while Tambaram students were busy readying for the protest. Again, to the shock of Chennai police, Gemini flyover was besieged, flags were waved and large-sized banners were hung from the flyover denouncing Chinese president and leaders alike. The protest was undertaken in objection to the visiting Chinese president Hu Jintao. Below the flyover, screams and cries of another group of Tibetan students ruled the road. Press missed no time in getting the best pictures of the movement as the cops in large number came to stop the protest and started arresting one by one. More than half of the protest members were arrested at different locations in the city; some were arrested while they were on their way to home. It created huge flutter on the main road. However, all of us were released in the evening. Tibetan diasporas never imagined that the self-immolations would continue in such an unprecedented manner. However, in contrary to Chinese claims of peace, stability and economic development in Tibet, Tibetans still continue to vent their anger against the Chinese government and their repressive and biased policies on them. They took to the streets of different parts of Tibet to arrest the attention of international community. As this didn’t heal wound of Chinese rule, Tibetans undertook the extreme but least non-violent method of expressing their dissatisfactions over the dragon’s rule and absence of their virtual leader, His Holiness the Dalai Lama. November alone saw more than 29 people self-immolating. Students in Chennai were teeming with sentiments of unexpected things happening inside Tibet. The charred bodies of young and old alike Tibetans looms their picture. They were and are burning from inside finding to see how to express in Chennai. Asking for police permission takes both time and uncertainty. Even if permitted, won’t get a sort of awareness and message we would like to spread. On top of that semester exams were going on. However, something had be to be done one day before it is too late to express our solidarity and concerns over the continuing self-immolations taking place inside Tibet. That too we can’t decide a day suddenly and start with. Therefore, a cabinet meeting was held as required to chalk out date and confirm the plan in order to ensure our work doesn’t go vain. The cabinet members decided to undertake a protest to highlight Tibet issue in general and self-immolations in Tibet in particular. Outside discussions were also on as to what, how and when to do a protest that would be able to arrest the attention of the Indian public to the Tibet issue and ongoing self-immolations inside Tibet. An emergency meeting of TSAM students was decided to be called on 18th November to discuss with the member students to retrieve some good ideas and also to gauge the members’ sentiment and decision. Meeting was held for more than four hours to decide the date, place, and manner of protest (with permission or without). Each individual sentimentally spoke about the on-going self-immolations inside Tibet and immediate necessity of having a protest at a place where we can best arrest the attention of the public. Every member both juniors and seniors spoke sternly and strongly about having a protest. Even though they differ on date, place or manner of protest one common thing they unanimously agree is to have a demonstration or protest. After group discussion each group representative spoke and finally landed on a common decision of going on a protest on 21st November at Gemini Flyover Road near United States Consulate at 3:00 pm. Each of us divided the work as it involves two way and grouping of protest one at flyover and other on the ground. Media concentration is most important as it is best and only means through which we can propagate our news and protest. I took charge of calling and contacting the media which may involve police intelligence getting information about us before we start our protest in case I use my presidential cell phone. In order to avoid any police receiving information I cleverly manoeuvred calls to the media including both English and Tamil from another number without using the presidential cell phone. Dalha, Phuntsok Palden and one more new student took charge of taking photos for the flyover and ground protestors. Taking pictures of flyover is most important as the banner must be shown to any papers or public. We then had a separate group who would be going to the flyover to put up the banners so that the whole public travelling around the road will see why we were protesting and against whom. Unlike before, it took almost half an hour for the police to reach the spot of protest. We had enough time to vent our anger on the streets. Some were shouting slogans, some speaking to media and many are kneeling down for worldly attention. Around 3:35 pm, police started pouring in and large number of traffic had also been blocked. Protest was still on both sides. A small contingent on the flyover successfully performed their job of unfurling the banners that read “Seven New Terrorist Leaders of China on Tibet” and another “Tibet is not part of China”. Later that group had been sent to the ground protest site. A police officer of higher rank warned me as he searches for the leader of the protest. He told me “stop this, why you are protesting here?”. I replied “we are protesting against china and seeking India and World attention to support us and stop self-immolations in Tibet”. He retorted to me saying “this is not the right place for the same and you are doing it without permission.” I replied in the midst of freedom clamour “ Yes, I know sir we are doing it without permission, but we have no option sir.” And I added “however, we are going back to home now.” The vexed police officer retorted again in Hindi “larthi-charge karna parega”. I said “Sir, go ahead”. He was shocked to hear that because he didn’t expect this sort of answer from my mouth. A big police van was arranged and we were all arrested in no time and taken to a marriage hall. I know that they would release us all. I told them we were going through exam and must be released to ensure that we appear for exam. For the first time an additional police commissioner, second in command of Chennai city police personally visited us and spoke to us. He questioned us for 20 minutes including myself as I attempted to answer his question on our students’ behalf. As senior police officer of the Indian government he wouldn’t agree to Tibet position. However, he honestly confessed that as a person he knew that Tibet was an independent country and he is still at heart with us. The revelation came when I asked him in the middle of quizzing me. I interrupted me in the midst asking “ Sir, do you support us?”. He said “Yes, of course I do support you and we are with you.” Then I continued “Is Tibet part of China?” For which he replied with stern look “Of course not, Tibet is not part of China.” I followed “Then why Indian government position is “Tibet being part of China”. He replied “As a government official I can’t do anything, but I know Tibet is not part of China”. He added “I know more about Tibet than you do. You are just a child to me. I am an international studies student in JNU and know about all these.” Facing his junior colleague he said “tomorrow it will definitely come in newspaper, police intelligence failure. I want all the reports and I will speak to the commissioner”. And he left accept numerous salutes from these juniors. We were released an hour later around 8:20 pm after a stern warning. The Gemini Flyover surely will again experience another protest whatsoever. I wish there is Chinese Consulate in Chennai so that Gemini Flyover and its friend U.S Consulates don’t have to see our protest. Editor's NOTE-- Tenzin P. Pam is a senior student majoring in political science at Madras Christain College, Chennai and he is also the president of the local Tibetan Students' Association in Chennai.